WHEN THE GLOBE-TROTTING OWNERS of this Basalt home decided to remodel, a wine room was at the top of their wish list. But rather than go the route of a dark cellar, interior designer Runa Novak of In Your Space devised a bright and innovative solution. “Let’s make it look like your favorite wine shop from one of your travels,” she suggested. And a beautiful wine room was born. In keeping with the storefront concept, Novak came up with the idea of a wide, floor-to-ceiling wall of glass that would mimic a shop window. 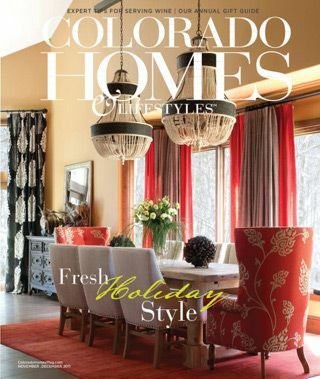 Then she reinforced the village feeling by choosing a Colorado buff stone flooring reminiscent of aged pavers. Initial plans for a bar table and chairs were scrapped when the owners, who have a background in the commercial display case business, fell in love with a particularly handsome glass case in Italy. Novak refers to it as a “light-bulb moment” that also solved the problem of wine glass storage. 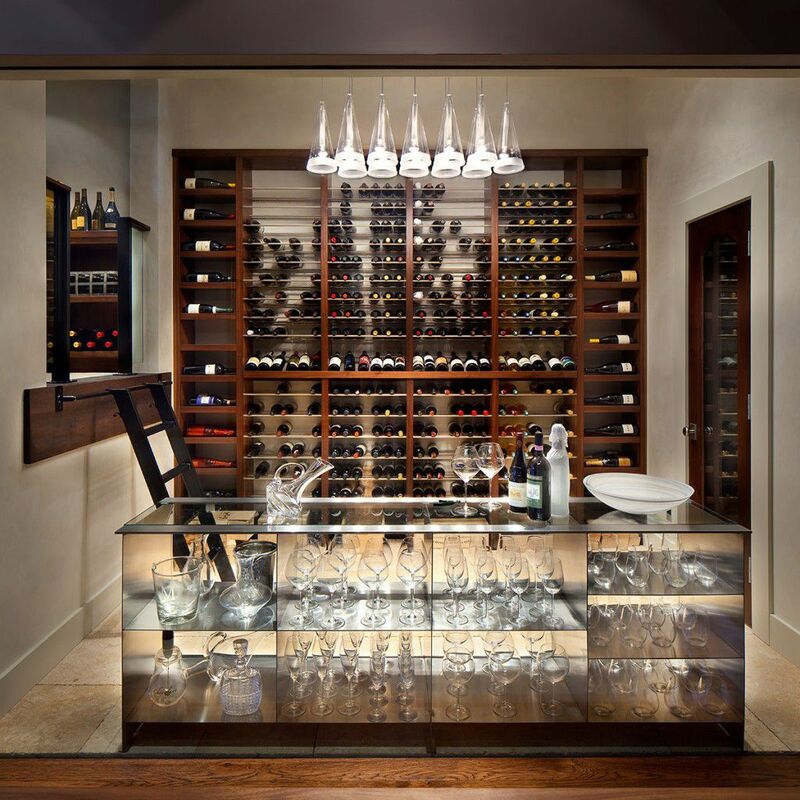 The display case was faithfully re-created by Precision Cut and Design, and now balances the wall-to-wall walnut and stainless-steel wine racks, custom-made by Brushaber Wood Design and ECH Woodworking. Novak chose the Italian, hand-blown glass chandelier by FLOS because it reminded her of a bouquet of upside-down champagne flutes. Borrowing space from a master bedroom closet, the designer was able to include a loft area for overflow storage, reached via a hook-on-rail ladder inspired by those in old-fashioned libraries. Clearly beautiful yet eminently practical, the entire room is also temperature-and humidity-controlled, resulting in a complex and full-bodied design success. Mix wood and metal for balance. Wood warms the metal and metal brings out the grain in wood. Clear glass light fixtures have a tendency to disabbear, while fixtures with etched glass make a stronger, more substantial visual impact. Rougher textures, like those of untreated stone tiles or wool rugs, help anchor the hard, shiny surfaces of glass and metal.